An alternative put forward by Galician nationalists for a political break with the Franco regime and aimed at setting up a legitimate political power in Galicia that would be responsible for overseeing the process of democratic transition leading to the constitution of a federal pact for the Galician nation within the Spanish state. A general outline of the principles and objectives that should preside and direct, respectively, the design of a development policy for Galiza and, more specifically, the development of its productive structure, with the vision that has the Galician Council of Political Forces (CFPG). The democratic bankruptcy happens in Galicia, on the approach of a Galician political alternative. And it is not enough to formulate it in the abstract, is needed to provide it with specific minimum content. First.- According to the national self-determination law, Galician political sovereignty falls on the Galician People. Second.- A government will represent and exercise political power in the Galician territory, until definitive political institutions are established, in the corresponding constitutional process. The federal agreement has to be accomplished on an equal footing to the negotiating principles set up by the legitimate representatives of people from different nations that today make up the Spanish state, as determined by their respective constitutional processes. 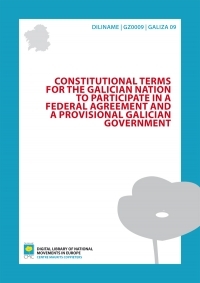 The federal agreement should not be able to reduce the Galician nation's powers of self-organisation and self-government, unless they are freely agreed to by their legitimate representatives in the aforementioned agreement. The federal bodies that are established, not only legislative but administrative and judicial, will be formed according to representation by nations, in equal numbers, regardless of the population and territory each one has. The political weight of the nations in the federal bodies will not be relativised by concession of equal representation in the member regions of any of the nations. This will not stop any nation, during its internal organisation, giving autonomy to the regions or provinces that make it up. The eventual convergence of the Federation into supranational bodies, whether political or economic, should be endorsed by the legislative members of all the federated nations. The contribution of each of the federated nations, according to the criteria of their respective economic capability and federal solidarity. The return from those activities subject to economic benefit, which the Federation takes on under its area of responsibility, as recognised under the federal agreement. The tax resources expressly stipulated in the agreement. Military type Armed Forces: army, navy and air force. The Federation’s overseas representation: diplomatic and consular services. Conclusion of international agreements. Declaration of war and peace agreements. Economic and fiscal policy coordination of the federated nations. Legal system and federal administration. Administration of justice in matters where legislation is under federal responsibility. Seventh.- Federal responsibility cannot be extended by judicial interpretation of the terms expressed in it. Jurisdiction not expressly attributed to the Federation will remain with the member nations. Eighth.- Federal jurisdiction of the armed forces will include strictly military type forces. Public order paramilitary forces will be under the federated nations’ responsibility. Youths that are conscripted will have to undertake their military service in Galician territory. Military staff assigned to duties that are "positions of trust," carried out in the Galician territory, must be endorsed by the Galician Government. All substantial changes to the function or military organisation in Galician territory, and undertaking non-routine military manoeuvres in it, should be previously advised to the Galician Government. If the Federation formally declares an overseas war, the corresponding federal bodies could dispense all that is set out in the previous three paragraphs. Ninth.- The Federation must allow the corresponding Galician national bodies to intervene in negotiation of agreements with other States or international bodies on fishing, in international or territorial waters of other countries, on emigration matters and any other matters that mainly affect the Galician nation's interests. Tenth.- The Federal jurisdiction on monetary policy is understood to be without prejudice to the Galician national jurisdiction on financial arrangements, specified in term 17. Political self-organisation and self-government, according to the Galician people's constitutional will, without any other limits than those set out in term 4, II. Legal system of the Galician administration. Legal system on civil liberties. Maintaining public order and declaration of states of emergency. Economic policy and economic planning. Civil, commercial and working rights; Social Security regulation. Administration of justice in matters where legislation is under Galician jurisdiction. Civil registration and work of the notary. Twelfth.- The determination of federal or national jurisdictions not stipulated in these terms will be referred to negotiation by the federal agreement, but once concluded, will be subject to those stated in term 7. Assignation of any jurisdiction at federal or national level would necessarily include legislation and execution on the given matter. In spite of everything, the Federation, with agreement from the Galician Government, could delegate the execution of those matters to national bodies. Thirteenth.- The official language of the Galician nation is Galician. The Federation's official language should be used in official matters regarding Galician public bodies and those of the Federation. Federal bodies that act in Galician territory will be obliged to use the Galician language in their activities with the administration, unless there is express agreement on behalf of the administration. Fourteenth.- A National Guard and a National Police Service will be created to maintain public order in Galician territory. Carrying out duties of governmental, judicial and fiscal police. Collaborating in passive civil defence. The Galician national bodies will lay down the regulatory guidelines for the municipal police. Fifteenth.- The judicial system on civil liberties will include regulation of rights for meetings, demonstrations, political, trade union and religious associations, and the regulation of the media. This system cannot ignore or harm the rights recognised under the Universal Declaration of Human Rights by the UN. Creation and management of a national economic plan. Nationalisation of the existing sources of wealth in the Galician territory. Measures for economic production and its commercialisation. Measures for financial institutions that operate in the Galician territory; creating a nationalised banking sector. Seventeenth.- The responsibility of financial planning, in particular the duty of establishing liquidity and investment fees, and compulsory reserve and investment funds, for all entities that operate in Galician financial areas, even if they are branches of non-Galician entities. Eighteenth.- The Galician nation will be able to issue public debt and the Government will be able to arrange treasury operations. Nineteenth.- The Galician national jurisdiction on education will include all grades and levels, whatever type of centre imparts them. Teaching will be carried out in Galician, at all grades and levels, however so as to take care of the Spanish speaking sectors, the Galician Government will be obliged to provide sufficient primary schools to take in the children from those sectors, where teaching will be in Spanish, with a view to a harmoniously integrating them into Galician cultural. Twentieth.- The public assets and liabilities affected by services that pass to Galician national jurisdiction will integrate themselves into the Galician public assets. A joint commission of the federal and Galician national Governments will determine the manner of transfer. This arrangement will also be applied to Social Security. Twenty-first.- A joint commission made up by the provisional Galician Government and the Spanish Government will establish the specific formalities to coordinate their respective procedures, according to the acceptance of guiding principles stipulated for the federal agreement. This commission will specifically determine, at each moment, and whilst the provisional period continues, changes to the federal system that may be temporarily imposed. Twenty-second.- As the provisional Galician government effectively takes over its Galician national responsibilities, the Spanish public bodies located in the Galician territory, whether belonging to the State territorial or institutional Administration, or to the provincial administration, together with those affected with the development of those responsibilities, will go on to depend on the Galician government. The incumbent officials or those affected by these aforementioned bodies will keep their professional category, except for those with political responsibility, who will be given appropriate security. Twenty-third.- The patrimonial transfer stipulated in term 20 will be automatically imposed for the services that the provisional Galician government effectively assumes. Twenty-fourth.- Whilst the provisional Galician government does not effectively assume its fiscal responsibility, the Spanish government will be obliged to provide it with the economic resources that the corresponding services were using, under the jurisdiction of the Galician government. In proportion to the Galician population with the entire Spanish state at the last officially approved census. Average expenditure costs, in the last two approved budgets, for each item of the Spanish State Budget affected by the type of services assumed by the Galician Government. Globalisation of the amounts referred to in section II, applying the proportional coefficient stipulated in section I. A special joint Commission formed by the Spanish State and the provisional Galician Government will periodically ensure the transfer completion, according to the aforementioned criteria. Twenty-fifth.- In no case will the provisional Galician Government remain in arrears due to the previous allocations made in the Spanish budget, as it has exclusive jurisdictions over the distribution of its contributions. Twenty-sixth.- A special joint committee will be formed by the provisional Galician Government and the Spanish Government and eventually with the rest of the national Iberian governments, to determine the fiscal, monetary and tariff policies, whilst the corresponding federal bodies are not set up. The Galician government will not legitimately recognise the arrangements adopted by the Spanish government on these matters without the consensus of the representatives of the aforementioned commission. Twenty-seventh.- During this provisional stage both languages Galician and Spanish will be co-official in the Galician nation's territory. The provisional Government will adopt the necessary measures to ease the implementation of a definitive system for this matter, as stipulated in term 13. Additional.- Without prejudicing all the other responsibilities that correspond to these terms, the provisional Government considers it essential to redress the most patently obvious spoliations made against the Galician working classes at the time of its proclamation.